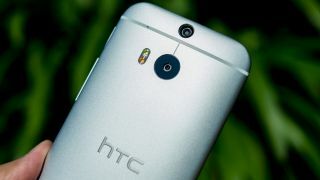 HTC launched the Desire Eye, a phone with dual 13MP cameras front and back. Water resistant to IPX7 level, it brings a host of new selfie features (sadly even Auto Selfie), a Full HD 5.2-inch screen and impressive 2.3GHz Qualcomm Snapdragon processor. The Zoe app got a big boost to Zoe 1.0 - available on all Android phones 4.3+, it allows you and your friends to remix (as in, change the highlights video you create) after the event with new pics and vids. What's more, it's even coming to iOS later in the year. HTC also announced the Re, a standalone camera that appeals to those that just want to shoot video, photos, slow motion video or time lapses. It's going to be $200 with other regions TBC, but it's a clever little gizmo that's essentially 'GoPro for the less active'. Or parents. 16.11 - Eye experience is coming to the one family in the next month. Oooh, a new phone next. What will it be? HTC Desire Eye! This is a phone that 'truly embodies the Eye Experience'. It's got a massive camera on the front. Dual 13MP? WHUT? 16.10 - Face tracking will mean you can all video chat from one phone, where four faces are placed in a video at once. As you know, most of us use a phone to have a video conference for work. 16.08 - We're now talking about the new 'Eye Experience' with Jonah Becker, VP of industrial design. This is going to be all about selfies. Oh no. This means you can now take pictures of yourself and a rear facing picture, or crop yourself into the snap. And Face Fusion is coming too, from the Desire 820. OH GOD AUTO SELFIES. If you hold the camera steady it takes. Please, make this trend stop. Please. 16.05 - We've heard what Double Exposure means, the name of the event. It means dynamic images. And we're going beyond the smartphone. Reimagining HTC. Does that mean the company is changing? My money is on the company getting into wide scale fish haulage. 16.03 - The CEO is here! It's the big Chou! Peter Chou is here! He's gone for a black shirt and jeans combo. Open collar, FYI. 16.01 - It's sort of back now. Hello. We've kicked off. Some video about fringes of souls and nudging and stuff about creativity. 15.56 - OK, we're here and ready to go - although the internet here is terrible, with a capital TERR. So bear with me if the updates aren't forthcoming initially... I've just sent some HTC elves scurrying away to stroke the internet box to cajole it back into connectivity. HTC is planning some big reveals today in New York, and we'll be there to bring you all the news the moment it breaks. Rumours so far suggest that a selfie-focused HTC Desire Eye smartphone will be the headline act, but there's also been hints of a Go Pro rival from the company. The phone is expected to come with a 5-inch display and a 16MP front-facing camera, however the Desire name makes it sound like this won't be part of the flagship range, which may be why HTC is choosing to announcing it alongside other products. It all kicks off at 1PM PT/4PM ET/9PM GMT. We'll be updating this page with all the news as it happens, so keep it locked to TechRadar.